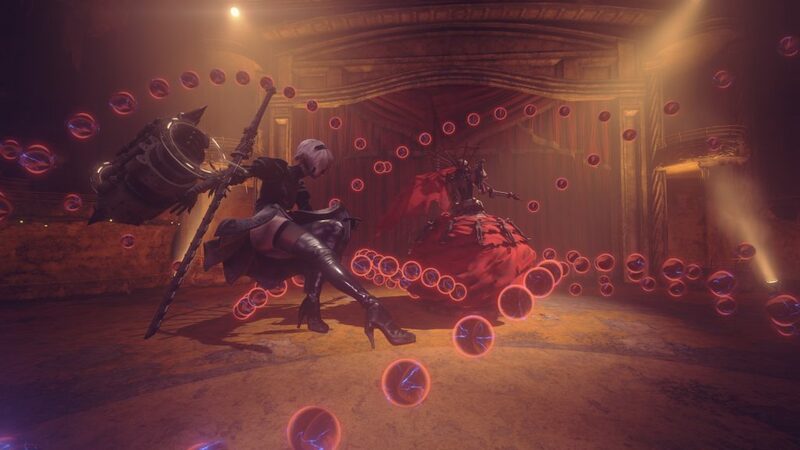 Towards the end of the game’s livestream event via the YouTube channel ‘Square Enix Presents!‘, the company treated viewers with never before seen boss battle footage of NieR: Automata featuring 2B and 9S fighting against the opera-singing robot! NieR: Automata is scheduled to release worldwide in early 2017 for the PlayStation 4. Stay tuned to Nova Crystallis for all your Square Enix news including NieR: Automata! Posted in E3 2016, NieR. That was incredible. Can not wait to play this game. Where does malfunctions end and AI insanity begin? I mean dead bodies worn as a dress and pretending to be an opera singer? If KosMos saw this she’d shake her head that robot completely lost it to this degree. WOW! I’m definitely picking this up when it’s released. Perhaps those dead bodies are androids from previous models sent way before the main androids displayed as decour trophies, the concept of this game really reminds me to Mad Max Fury Road from what Square-Enix and Platinum Games have displayed about the post-apocaiptic enviroment, just hope the main campaign lasts a fair ammount of time along hopefully side quests and be an open map instead of lineal chapters. Never been interested in the Drakengard franchise nor Nier spin-off, but Drakengard 3 really peek my interest but decided to skip it, but, after seeing a cooperation between Square-Enix along Platinum games, responsibles for games like Bayonetta and Metal Gear Rising, and the glimps of 2B’s design and more with the theme song performed by J’Nique Nicole, I totally in, and at least it was confirmed one doesnt necessarily needs needs to keep up with the Drakengard series. I’m interested in this because I hope I can finally find a action RPG that rival KH games. But if this one lacks towns and is short that’s already bad. Doesn’t seem like a robot even with AI would put up trophies of foes it beat. Especially if they were robots they fought. But maybe the robots in this game have as much personality as the humans did.